Following up on the most Koreany of all Korean food, kimchi, we move along to what is likely the most enjoyed Korean dish in the US, the famed Korean BBQ, bulgogi. Oh yeah! We’ve got a couple of ways we make vegan bulgogi, but today we’re going with tempeh (you can also use seitan which we use for our pepper paste bulgolgi recipe). It’s convenient, pretty inexpensive, and yummy. This recipe is super easy and quick. 1. Slice the narrow end of the tempeh into 1/4″ slices. You want it thick enough to hold together as you mix it, but narrow enough to soak up the marinade well (optionally, you can steam or lightly boil the tempeh for 15 minutes before slicing). 2. Mix the marinade together and marinate the tempeh and onions in it, at least half an hour (but I wouldn’t go more than a few hours). 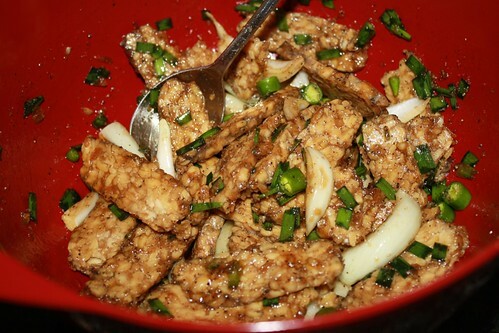 Be sure to stir the tempeh now and then to ensure it marinates well. The amount we listed in our recipe is what we use and is sufficient for us. But it doesn’t waste any marinade, it will soak it all up. If you’re not going to stir it now and then or would rather have a stronger flavor, you can double the amount of marinade, but we don’t feel like it’s necessary and you’ll end up throwing some out that way. 3. You’re now ready to grill your tempeh, garlic, onions and peppers. You can also just saute it, but really grilling is much better. If you’ve got some extra marinade left, you can spoon a little over everything while it grills. 4. 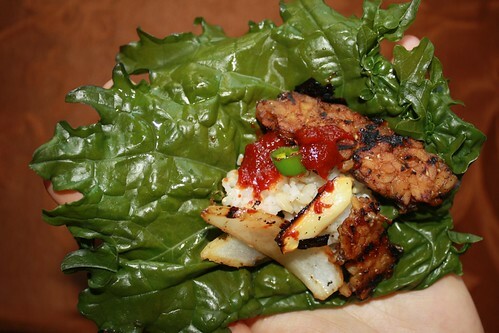 Grill everything and serve by taking a lettuce leaf, adding a bit of your sauce of choice (ssamjang is traditional but gochujang is just fine), rice, some kimchi if you feel like it, and the tempeh, garlic, and onions. Wrap it up like a taco and devour. Nummy! If you want to eat it like an authentic Korean, you put the whole thing in your mouth at one go. I’ve noticed that kids also enjoy this challenge, but keep in mind that the leaf lettuce in Korea is much more bite-size friendly, so you’d be better off using smaller leaves or tearing them into smaller pieces to keep things truly bite-sized. We used Asian chives from our garden instead of the scallions. Don’t forget to stir the tempeh now and then, particularly if you don’t double the marinade recipe. We love, love, love garlic. So use quite a bit when grilling. Be sure they are well cooked before you eat them! Instead of leaf lettuce, we used the last of the season’s kale from our garden. We steamed it for 15 minutes until it was nice and tender. Kale is so good for you, so be creative in how you work it into your diet! Mmmm. Salivating just looking at it. ← Updated: Vegan Kimchi Recipe! Looks interesting. I have never tried Tempeh so it would be quite the experiment. Thanks for coming by. Let us know what you think! This looks great, thanks. I make my own tempeh as it is expensive and hard to find where I live. So I will try this the next time I make a batch, minus onions though as I am allergic to them. Hi, Julie! Great, hope it turns out yummy for you. I know, tempeh is pricier than tofu and other meat alternatives. We always buy in bulk when they are on sale, as our local grocery store often has them marked down. But you make your own tempeh – that is so cool. We make our own seitan but we haven’t tried making tempeh yet. Please share how you make tempeh if you don’t mind! We’d love to try making it ourselves! Dear Sunnie, I also make my own tempeh and use the instructions in “The Book of Tempeh” by William Shurtleff and Akiki Aoyagi. I started as a girl when I asked my father to convert a thermal trunk cooler into an incubator for Christmas; following instructions from the book. However, a warm oven with a pilot light might work–it’s in the book, and probably now there is more information online; maybe even a video uploaded somewhere. Good luck, it’s not hard once you have the incubator and spores (from fresh tempeh or from a supplier). Cheers. Oh wow, this is so neat. Thanks Julie, we will have to try this sometime soon and let you know how it turned out. I’m very excited! Great, Julia! I’m glad the recipe worked well for you. We haven’t tried (or even seen) soy curls yet but are intrigued. We’ll have to check them out. Thanks for sharing. We’ll have another post up on another delicious bulgolgi made with pepper paste in the next day or so, so come back and give it a try too! Yum! I love bulgogi. I will try it with tempeh (btw, I am Indonesian and grew up with tempeh). 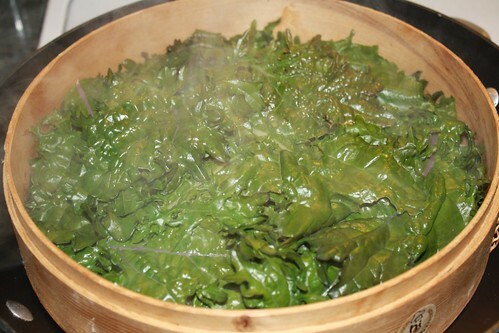 I love the seasoned seaweed laver (seasoned seaweed sheets) sold in Korean market to eat with bulgogi, brown sticky rice, sesame seeds, but kale is great, too, and healthier! 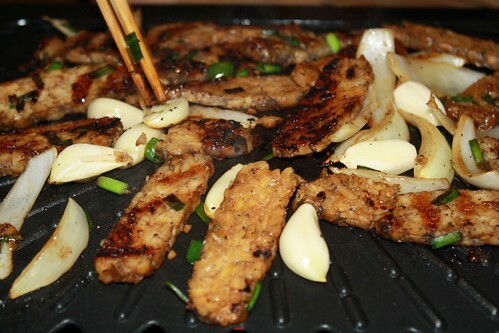 Where can you find tempeh in seoul? Hi, Gigi. Since we’re only in Seoul occasionally, I’d recommend you check out the Vegan Korea Facebook group as a resource for finding ingredients in Seoul. I’d recommend the Loving Hut restaurants as a good place to find good bulgolgi meat substitutes. They typically sell them dried in packages and then you can rehydrate. Someone did ask this very question on the Vegan Korea Facebook question last month, and here is the answer that was provided: Itewon Foreign food market in itaewon in the freezer section. So good luck and thanks for visiting! Hi! I know this is an older post, but I think you’ll see it. I am using your marinade recipe for some seitan. I splurged and bought a dish for 구절판 recently, so I’m making that and bringing it to a small get-together with a couple of friends tomorrow. 🙂 I’m excited about finally trying this lovely and iconic dish. I’m trying to finalize what to put in the sections. I’m thinking shredded bulgogi seitan, carrots, radish (I couldn’t get to the Korean store, so I’m using daikon, which I know isn’t ideal, but I think it’ll work), cucumber, two kinds of tofu (made to look like the whites and yolks of eggs, lol), and peppers. That’s only seven, though, isn’t it? Since I don’t like mushrooms, I’m not including them. Do you think that sounds like a good array? I wonder what should be the last thing. Maybe thinly julienned scallions…. Thanks for this recipe and (in advance) for any tips you might have. I know your cat loves vegetables. Maybe you could ask her for me, hee hee. I’m about to make the pancakes. I don’t know if it’s okay to make them the day before (I have ground pine nuts to put between the layers to keep them from sticking). If not, I will consider it a well-spent practice session. I’m not so great at pancakes and crepes. Wow, Sunnie, thank you for the rapid response! That’s a crack team you have over there. 🙂 I just finished with the pancakes, and they seem OK. A little misshapen, but next time I make it, they will be better. Spinach! Yes! Why didn’t I think of that? Thank you. I was really surprised at how expensive the dish was, but it’s so pretty–wooden, and the central dish is octagonal rather than round; different from the one on the cover of my cookbook (A Korean Mother’s Cooking Notes). Thanks again, and have a great weekend. Happy New Year! Sounds so wonderful. Please share some pictures if you can Lu! And have a great time with your friends! Tempeh in the house!!!! 🙂 Thanks for visiting, Ranie. Hope you enjoy! Sunnie, I have one small question that I didn’t think about before. I’ve never eaten this dish, so I don’t know how you do it. I know you pick up a pancake and add whatever you want, but do you then fold it over like a taco, or roll it up in a cylinder? Could be a silly question, but I’m wondering how people do it. And if I do take pictures, I’m sure you want to see how the guests made and ate them. 😉 Thanks! Hi, Lu. 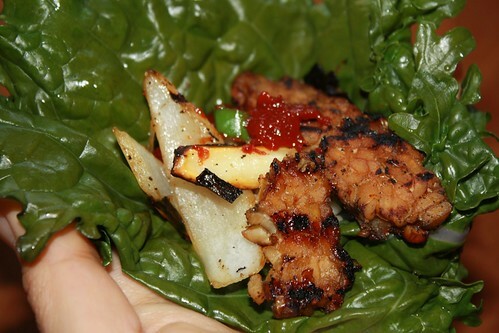 As part of the crack team here at vegan8korean, I’ve been asked to relay that you just fold it up like a taco! 🙂 Have fun. We can’t wait to see the pictures! How do I send you pictures? 😀 Unfortunately, I got to my friend’s house, turned on the camera, and got the “low battery” message. I could only get off two shots before the batteries died, and the view of the 구절판 is partially obstructed, but you can still see it. But I was so happy they loved it. I was a little worried, because the daikon had a faintly unpleasant smell, and of course, the dish is 100% new to them, but once they tasted the flavors and had fun making up their own little tapas, they said things like, “This is so fresh and healthy-tasting!” and “this is really good!” So, I was glad. It was an incredible amount of work. I think I was chopping and sauteing for 2 hours! But I often find that to be the case with Korean food because of the chopping and separate prep for each vegetable (same thing with japchae). In the end, of course, it’s worth it. I have all the leftover vegetables and tofu, and I plan to make bibimbap with them. 😀 Thanks again for your advice, Bill and Sunnie! Hi, Lu. I’m glad it was a success. The easiest way to share photos would be on our Facebook wall, but I don’t remember if you’re a fan on there. You can also link to an online photo in the comments if you upload it elsewhere, or let us know if you’d prefer to just email it, and we can send you our email address. Thanks! Sunnie, I just found thermal cooler incubator instructions from VeganBaking dot Net’s “How to make tempeh” page. My Dad would have liked this back then–The Book of Tempeh’s instructions had him drilling holes into plastic! This one is much easier. A thermometer is absolutely necessary. I’m trying to find tempeh starter instructions online from live tempeh, but if all you have accessible is frozen tempeh that won’t work. Funnily enough though you could order packets of tempeh starter that ships worldwide and is made right here in Belgium from TopCultures. BTW, I have no affiliation with any of these companies or books that I recommended. HTH!